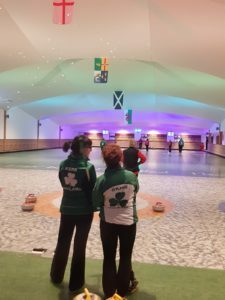 In the opening games of the Four Nations at the Barton Grange Flower Bowl in Preston, the two Irish teams of the interesting ice had mixed fortunes against Wales. 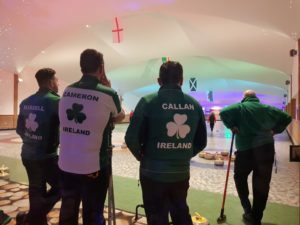 The men’s team of Johnjo Kenny, James Russell, Arran Cameron and Steve Callan lost by a shot to the Welsh. 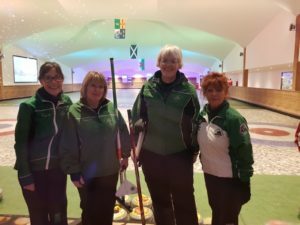 On the other sheet, the women fared better with Marie O’ Kane, Louise Kerr, Gillian Russell and Maria O’Neill winning by two shots. A different style of ice decoration with grass and pebbles replacing the traditional white ice sheet can be a little disorientating at first but after a few ends we all began to get out bearings again! 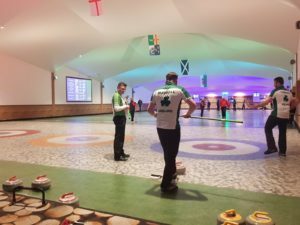 The Irish men and women take on England at 9am in the morning. Good luck to both teams.